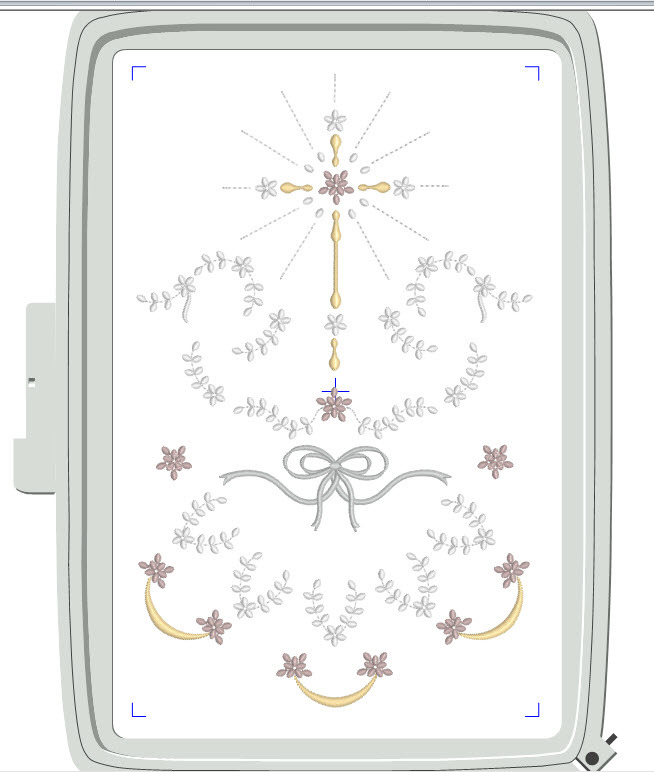 My purpose when I digitised these designs was to give as much scope as possible for heirloom embroidery. Each design is split up into colour sections so you can change these one colour designs to several colours. Now when you do this I suggest that your choices are subtle rather dramatic. 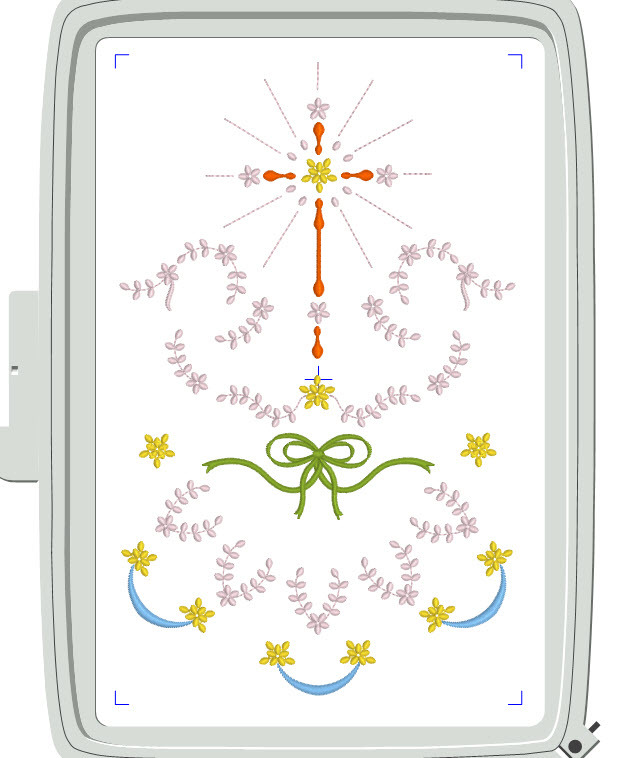 This design #25 from Georgiana 3, open in a 240 mm x 150 mm hoop. There are actually 13 colour changes in this design so lets change a few. As you can see I have made a few changes and chosen bright primary colours so you can my selection but I could never stitch out a heirloom design in these colours. Sorry I am very fussy about colour as my dear husband has found out! Now I am going to change these colours to more acceptable ones. This is one my new colour charts that will now be featured in all the accompanying PDF’s to my designs. I hope that you will find them more useful and they eliminate the chance of errors in my colour lists. 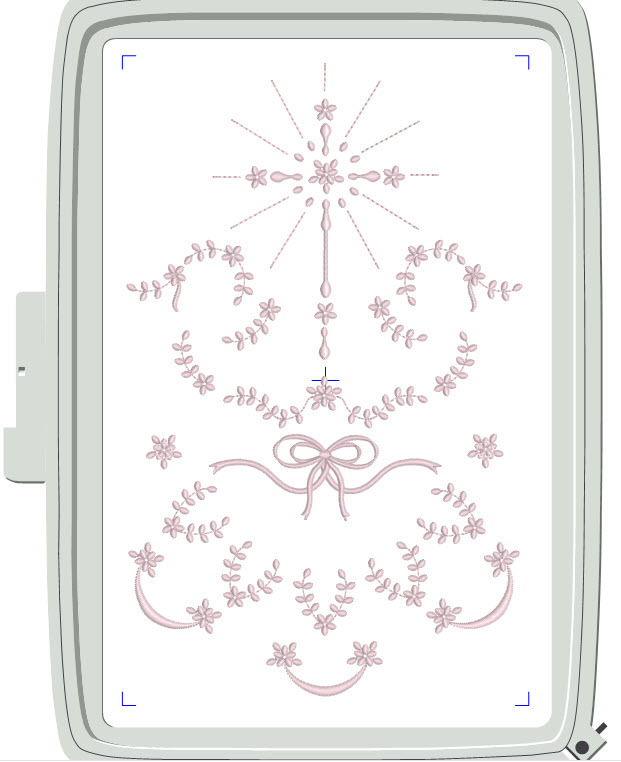 The design has 14451 stitches. 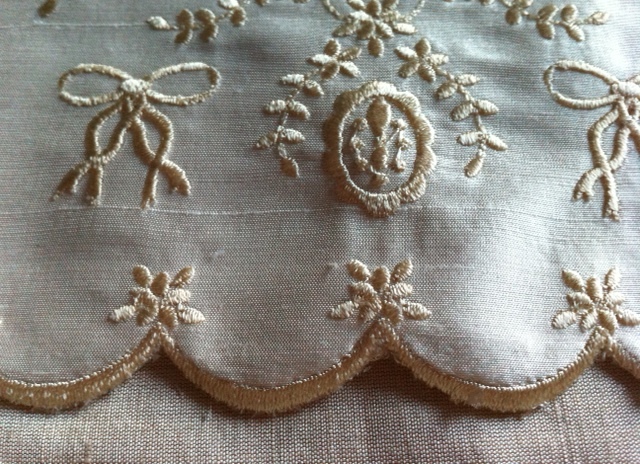 Here is the design stitched out in these lovely colours on pale cream silk dupion. Sulky Rayon colours beginning with 18 are not available in the UK, so I get mine from the USA as they are such gorgeous shades. Many of them have become firm favourites in the last year or so. 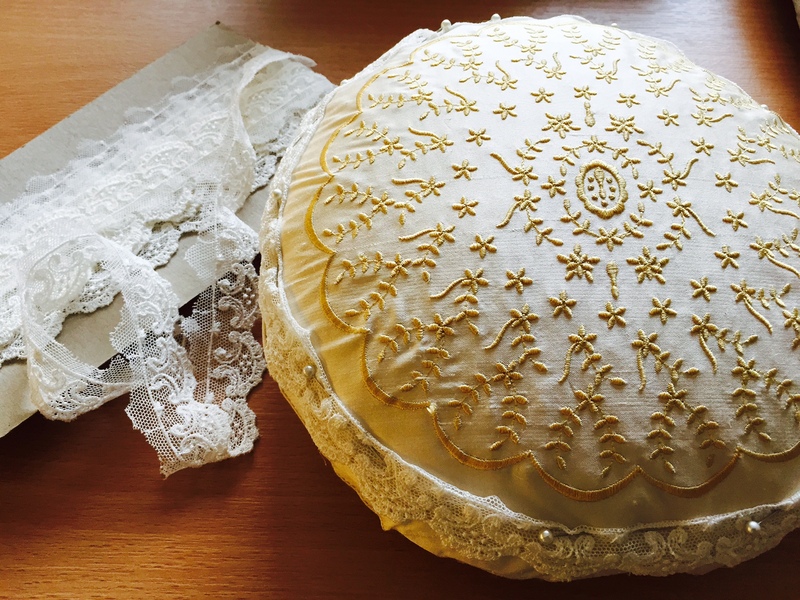 The designs from the Georgiana collection have been used to create some wonderful projects including this lovely cushion embroidered with GFE-GEO-5-1 and trimmed with some exquisite Nottingham lace. 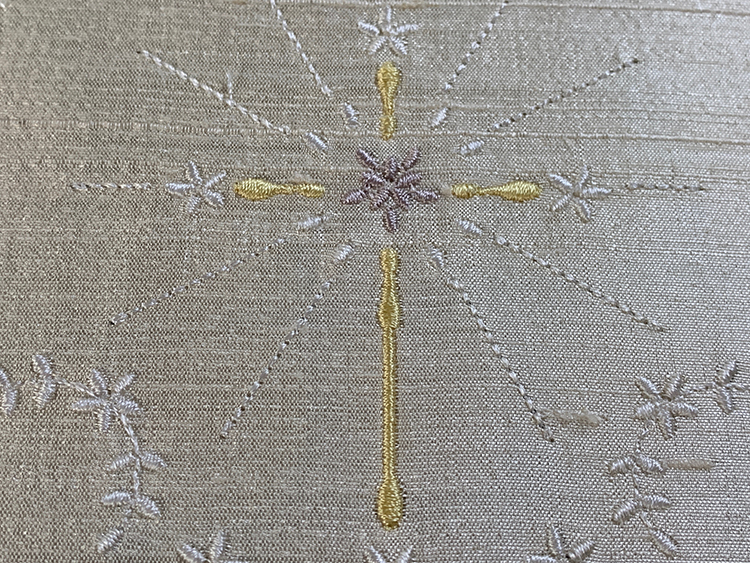 As with many of my collections, I have done my best to include everything you should need for heirloom embroidery and these are the scalloped edges. The collection also features monograms so you can personalise your embroidery. 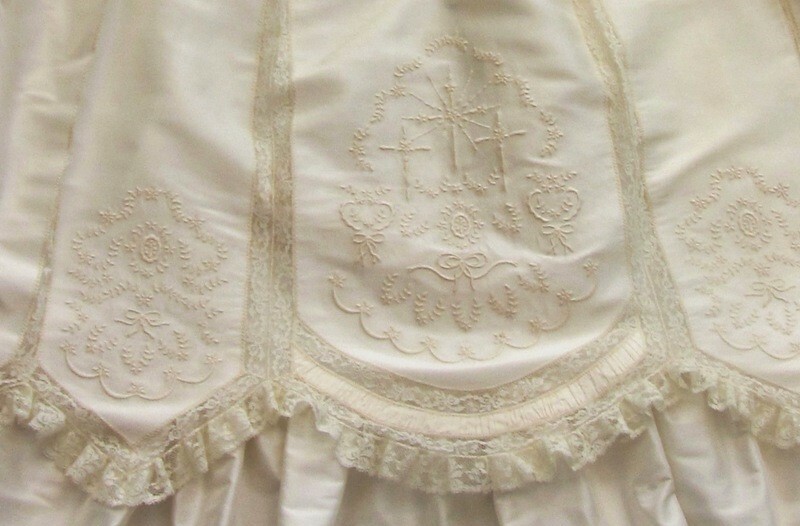 This amazing Christening gown has been embroidered with designs from the collection. The monthly collection offer comes to an end on January 31st. Get your designs now. 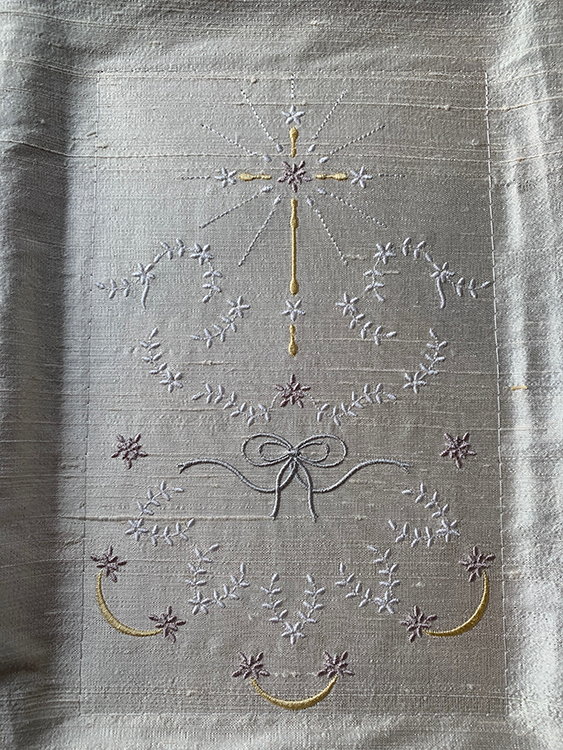 This entry was posted in Discussing machine embroidery, Embroidery projects and tagged embroidery on silk, heirloom embroidery, machine embroidery. Bookmark the permalink. This was vey interesting, and the color changes are gorgeous! I totally agree with not using bright colors on heirloom embroidery. Thank you Hazel!